After great success in their Euro 2016 qualifiers, Austrians are again talking about building a new national stadium. Budapest is given as example for Vienna. Austria managed to dominate their Euro 2016 qualifying group despite having Russia, Sweden and Montenegro as rivals. Not only did they win most home games, they also defeated every (!) rival away. The undefeated run ended on Monday, when they won against Liechtenstein at home in Vienna. That game was obviously sold out as a celebration was planned, but the national football association (ÖFB) claims it would have sold 70,000 tickets, should the national stadium be big enough. With current constraints only under 50,000 people were able to attend on Monday. Speaking for Nachrichten.at, ÖFB president Leopold Windtner suggested not only top games of Austria require a bigger venue. 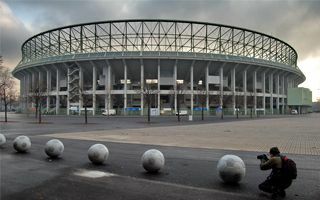 “This arena is no longer suitable to hold large-scale events like the Champions League final or games of a major tournament. Action is required”. Currently 60,000 is the absolute capacity minimum for CL final venue, but stadia larger than that are preferred. Windnter thinks Austria should look up to Hungary, who are now launching their new national stadium scheme. “Prater offers good opportunities and is an ideal location. What they’re doing in Budapest, where a new stadium is being built on the old one’s site, would be a good solution for Vienna”, Windtner said.